The allergies have left the building! I made some cookies to celebrate my freedom from the invisible nose tickling elves! Pesky little things those elves. I will have to make these again and change a few things before I post the recipe because they're not *exactly* what I wanted yet. 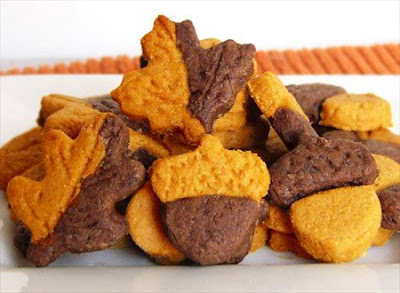 Anyway, they are sweet potato and chocolate shortbread cookies shaped like leaves and acorns. They were so tiny and addictive that I think I ate a million of them (there I go again making tiny foods). 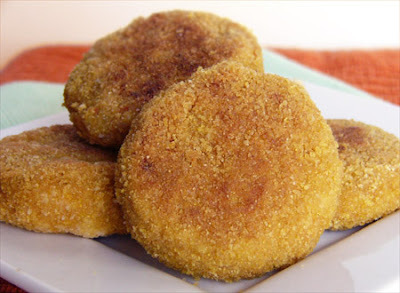 Last night we had the crispy chickenless nuggets from Happy Herbivore's Sneak Peek e-book. They were super crispy! Next time I think I'll make the banana bread from the same sneak peek. I would never have thought of pairing up sweet potato and chocolate, but it sounds really, really good! Great job on those cookies AND those chicken nuggets! those cookies are so cute. 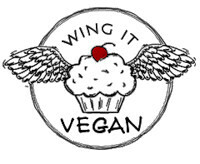 Can't wait for your spooky VeganMoFo! Tofufreak: I used my brand new Autumn and Halloween mini cookie cutters. For the acorns I cut out some chocolate ones and some sweet potato ones, cut all the tops off and interchanged them to make them bicolor. The leaves are just merged chocolate and sweet potato dough. interesting flavor combo on those cookies....cute too! 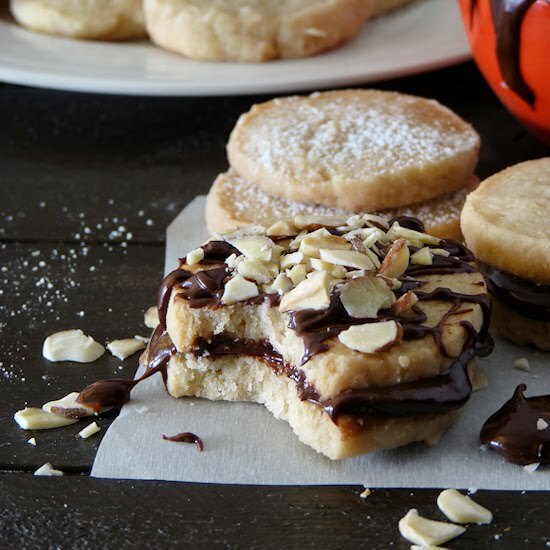 These look fantastic, can't wait for the recipe! I love those cookies...how did you do that? They look so fantastic....way to go! those cookies are too freaking cute! Oooh I love themes! And surprises! And sweet potatoes! And chocolate! i really neeeeed to get the e-book..really bad, everything looks so awesome that people have made, especially those faux chicken nuggets! Recipe with full instructions coming up this week! Just happened upon your website. I'm very interested in your shortbread recipe. Did you post it and I missed it?